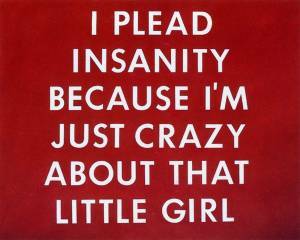 Edward Ruscha is one of those "concept" artists (whatever that means) that you either get it or you don't get it. If you don't get it, don't worry; most people don't, and it has no reflection at all on your intelligence or whether you appreciate "Art" with a capital A or not. Given Ruscha's style, I didn't think it necessary to post very large images since there is not a whole lot of detail to be examined in his work. These small samples will do just fine for judging whether you get it or not. 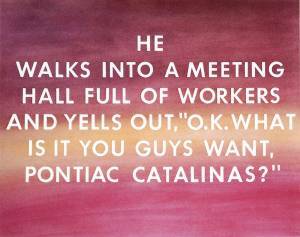 It You Guys Want, Pontiac Catalinas?" 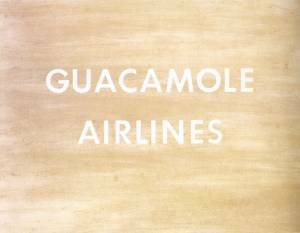 Edward Ruscha, 1976. Pastel on paper. 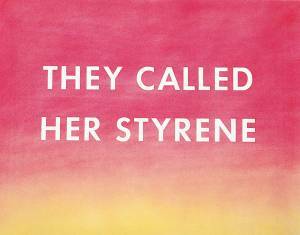 Edward Ruscha, 1976. Spinach on paper. 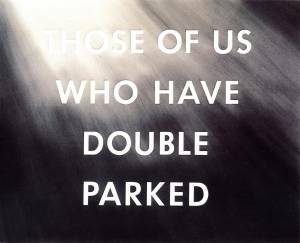 Edward Ruscha, 1977. Pastel on paper.